San Francisco’s baseball team, the Giants, and Gehl Studio are planning a pop-up shipping container village on a waterfront parking lot just across McCovey Cove from AT&T Park in Mission Bay. The Yard, as the project is being called, will consist of a beer garden, coffee shop, retail stores and a waterfront deck, all on land intended for a 1.7 million square foot mixed-use development called Mission Rock. But until that project begins construction, the 9-acre site, according to Gehl Studio project lead Blaine Merker, will consist of 15 shipping containers salvaged from the Port of Oakland. The containers will line Terry A. Francois Boulevard, some perpendicular to the thoroughfare, some parallel, some stacked one atop the other, and most creating outdoor rooms for congregating. According to the SF Chronicle, the Giants will spend $2.5 million on the project and pay $77,000 in annual rent to the Port of San Francisco. Until now, the city’s most famous pop-up container village was Proxy, in Hayes Valley, designed by Envelope A+D. 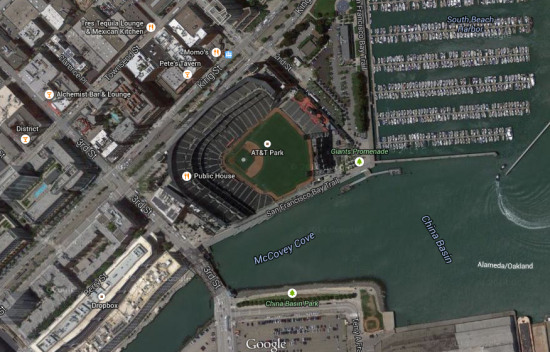 Plans for The Yard were presented to the Port of San Francisco this week, and the project is expected to open by March, prior to the baseball season.